curated by Jacqueline Aust with guest exhibitors Alexis Neal, Kate McLean and Jeff Thomson. 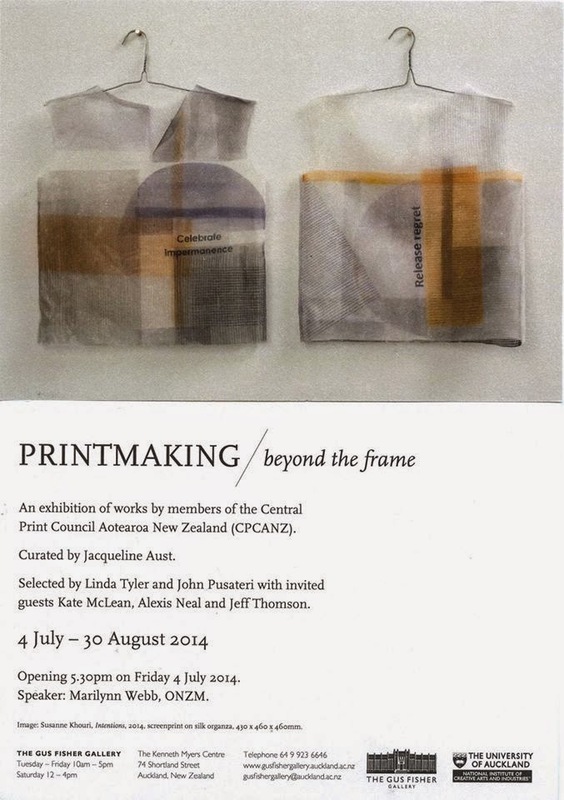 An exhibition of work of members of the Central Print Council Aotearoa New Zealand (CPCANZ). isolating it from the wall and forming a barrier of protection or decoration. It also refers to the contemporary perception of print. while retaining a common reference point in traditional printmaking processes. which was established in 1994 by Alan Loney and Associate Professor Peter Simpson. who gave the University the printing equipment that formed its basis. for his woodcut print portraits of naked men and women. Related Events: Put these on your calendar! with Linda Tyler (Director of the Centre for Art Studies). with Virginia Were, editor of ArtNews New Zealand. exhibition Printmaking: Beyond the Frame. and Steve Lovett (Lecturer, Manukau School of Visual Arts). Jeff Thomson, Kate McLean and Alexis Neal explain the use of print in their work. with reference to the New Zealand artists with whom they work. in conversation about their meticulous methods with Peter Simpson. interviews founder Peter Simpson about the press’s history. reflects on his involvement with the Holloway Press. is available for sale for $10.